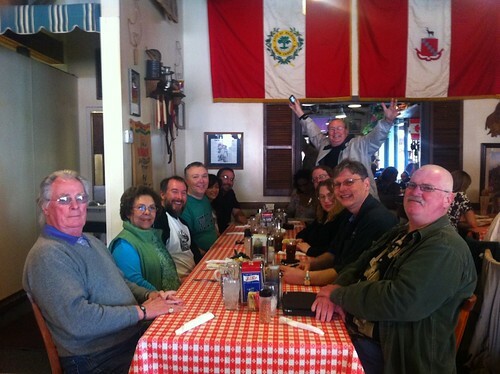 Some folks in our group left at 6am to get a start on the day at Sunrise Biscuit Kitchen. But we couldn't make it out that early; we had to struggle to join the group at 7:30 at Once in a Blue Moon Bakery in Cary, NC. Once in a Blue Moon Bakery is in an artsy area of Cary; there were murals and statuary in the shopping center, and several artsy stores that Lori would have happily spent hours in, if only they were open that early. 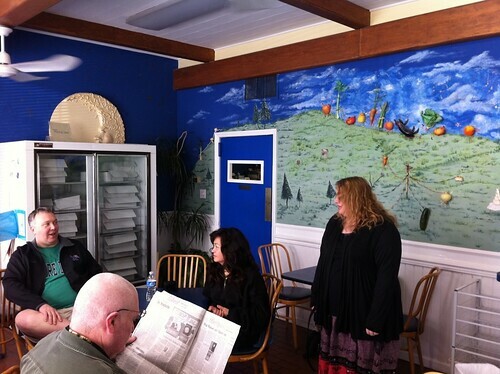 The bakery itself continues the artsy theme with a big mural of gamboling vegetables. Some Roadfood trips develop themes - or at least, leitmotifs. This trip's was The Quest for Pie. buffetbuster is very fond of pie, and led us to Once in a Blue Moon Bakery because they were reputed to have good pies. Their website lists these flavors: Apple Crumb, Apple Cranberry, Cherry, Chocolate Bourbon Pecan, Coconut Cream, French Silk, Key Lime, Lemon Chess, Pecan, Sweet Potato Pecan, and Pumpkin - but none of them were available Saturday morning, leaving him pieless. Instead, Lori and I shared a lemon square and a cupcake. The lemon square was only notable for being somewhat large; the cupcake was good but unremarkable. 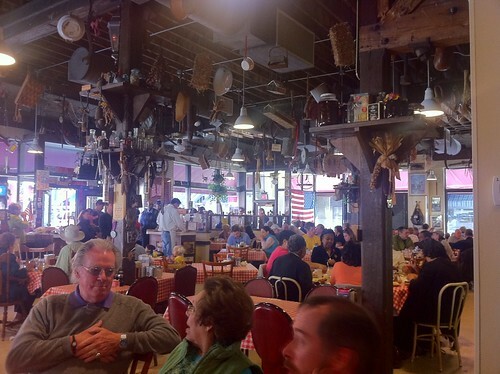 From there, we went to Big Ed's City Market in Raleigh. All I know of City Market comes from this cursory visit, but my impression is that it was once a working place that got yuppified, such as has happened in several other cities. 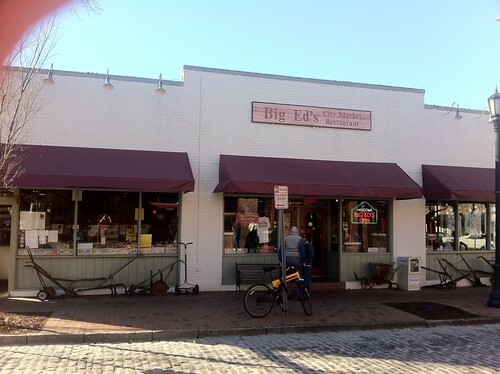 But the yuppification has not yet overtaken Big Ed's, which would make a farm tractor parked in front look right at home. Big Ed's was our first gathering of everyone who was there for the weekend, including Paul Smith and Roz and Chris Ayers' parents. Big Ed's may have been my first encounter in years with that nectar of the South, sweet tea. The tea had so much sugar that a little evaporation would have caused sugar to crystallize out. I'm not yet a jubilant fan, but it did complement a plate of biscuits nicely. The biscuits came out first, pale yellow rounds. 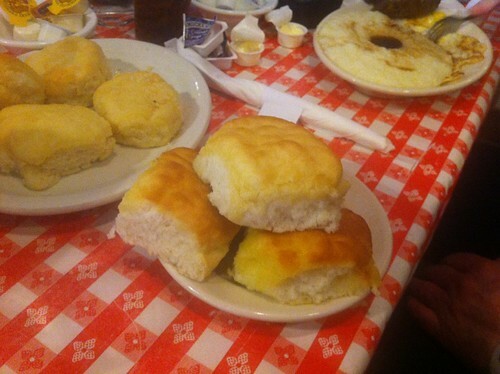 The waitress recommended poking a hole deep into the biscuit with a finger, inserting the tip of the molasses bottle, and filling the center with molasses. I tried that, and concluded that I preferred the biscuits without the molasses. Paul requested biscuits that were more done, and I preferred the browner biscuits he received. Chris and I were drawn to some of the unusual offerings on the menu. I ordered the brains and eggs, after a careful explanation that I was buying this for the table instead of for myself - I wanted to be free of the assumption that I would finish the plate. (It was not clear from the menu whose brains these were, but I assume they were pork.) We made lots of zombie jokes about the brains and eggs - you can probably imagine them all. The brains and eggs had a certain organ-meat flavor, but it wasn't very strong - but eating them made me gag, and I choked my one bite down with difficulty. I don't know whether this was due to the taste of the dish or two my own anti-organ-meat biases. I'm not eager to order it again, though. As of this writing, I am showing no signs of zombiehood or kuru. 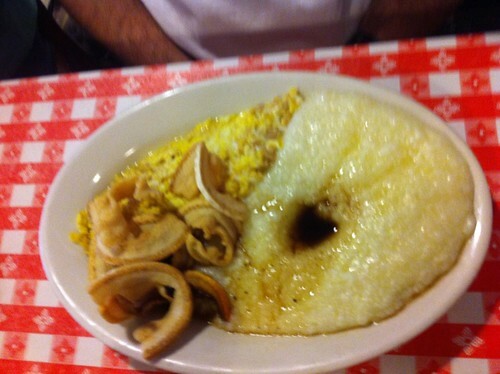 The grits with redeye gravy that came with the brains and eggs were pretty good. 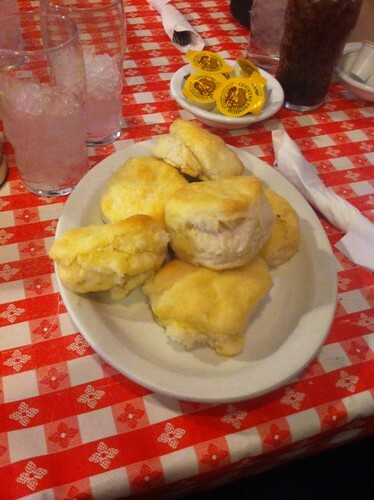 I also ordered a country ham biscuit, of which my major memory is the powerful salt of the ham. Chris matched my brains and eggs by ordering the fish roe and eggs, which spawned lots of jokes about animals that didn't make it to childhood. The roe and eggs tasted very fishy; I didn't care for them. Chris also added an order of fatback, which was new to my experience. Fatback is cut from the back fat of a pig - it's essentially like bacon without any meat interfering with the fat experience. This fatback had been fried until it was crisp and puffy - the experience was something like a pork-flavored Cheeto. In this picture, the fatback is the curlicues on top of the eggs. I recall that Paul's sausage was quite peppery, too much so for my pleasure.